The great thing about PowerPoint is that everybody has it, and most are familiar enough with it to put a poster together with a minimum of effort. We publish free PowerPoint templates that you can download to give you a starting point, and most people tell us they can create a poster in an hour or two using one of our templates. Where it gets challenging is when you take a .ppt or .pptx file from one computer to another. Whether it’s your Mac at home and PC at work, or different versions and platforms that your collaborators have, getting everyone to see the same thing can be tough. We’ve been printing posters from PowerPoint for 20 years, and we offer this note to help people who are collaborating on the production of a poster. We hope it makes your life a little easier. We’d be happy to hear feedback from you about issues you have. Know that PowerPoint is not totally faithful from one version to the next, and especially between the Mac and PC. We suggest that you stick with Arial and Times New Roman for fonts, and use Symbol for Greek letters. A lot of the problems we see begin with someone not having a font installed on their computer when it is being used in the PowerPoint file. PowerPoint substitutes Times for the missing font, and you see something different than what was designed. Stay away from fancy effects like word art and transparencies. Also, features that are new to PowerPoint 2007 and beyond will disappear when you save the file back to the .ppt format. These include embossed type, drop shadows, and inserted symbols. If your colleagues don’t have the latest version of PowerPoint, you can send them the older .ppt file, but send us the pptx when you are ready to print. Microsoft publishes a compatibility pack so that older versions can read the pptx. To check your presentation for compatibility when you save it in PowerPoint 97-2003 format, click file>info>Prepare for Sharing>Check Compatibility. It's a good idea to check the box so that it will always do this. Somebody needs to be the keeper of the design. The quarterback sends everyone a pdf or jpg, and since they cannot be changed, should represent what is on the screen when viewed by the collaborators. The quarterback gets feedback from everyone else and implements the changes, and sends them back another pdf or jpg for the final go ahead. PowerPoint 2007-2016 have decent pdf makers. There’s one in 2003, but it never seems to work very well for us, and will only make a letter size pdf. All versions will let you save the file as a jpg that is accurate to what you are seeing on your screen. Note that a jpg file is sufficient for proofing purposes, but should not be submitted for print since it's only 64 dpi. Only a ppt, pptx or pdf file will provide acceptable print results. One thing is for sure- if you send PowerPoint files around, there’s a good chance that different people will see different things on their screen. It gets really confusing to suggest a change to someone who sees different things than you do! Third Rule- Expect no help from Microsoft! PowerPoint will do the job, but Microsoft isn’t going to fix it’s idiosyncrasies for us. Get used to it- they expect you to be using PowerPoint with a projector for standard sized slides, and they expect you to collaborate with people who are using the latest version of the program. 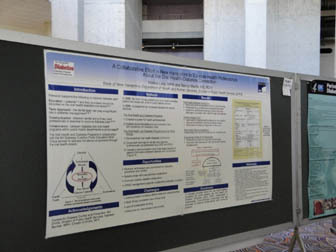 What is really required to successfully get a poster out of PowerPoint is a printer who knows the program. They do make an Office Compatibility Pack that will allow you to open a .pptx file with PowerPoint 2002 and 2003, and that’s a great help. Since it essentially converts the .pptx file to a .ppt, it loses the features new to PowerPoint 2007-2016. The faithfulness problems between versions remain when using the converter. You can download it here. We’ve tried using Windows Live as a collaboration tool. Essentially, it takes whatever file was uploaded and opens it in the PowerPoint program that’s on the computer viewing it, so it’s the same as emailing the file to a collaborator in terms of what they see on the screen. The on-screen viewer in Windows Live doesn’t faithfully show the PowerPoint file either- the same file open in Windows Live and in PowerPoint, on the same computer, will show differences. Microsoft PowerPoint 2007 Viewer allows you to look at a PowerPoint file, but has the same problems. Additionally, it doesn’t allow you to zoom in to see the poster in detail, and that limits it’s usefulness as a collaboration tool. Google apps has a presentation program, but it only allows 7.5x10 size, which is really not useful for designing posters. There’s another great reason to send native PowerPoint files to us- we then have the ability to fix your file if we find a problem. Since we can’t change a pdf, we wind up calling you to change your file and resubmit it, which can delay your order. 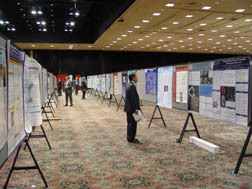 Our research poster customers are some of the smartest people in the world, but I think most would admit they are not graphic designers. Our designers find it necessary to make a change in about three quarters of the files people send us. We substitute a better quality logo, fix the text that runs off the bottom of the page, and change type to white from black when it is against a dark background, and look for anything else that might keep the poster from looking clean and easy to read. We gave up a long time ago trying to proofread posters- we don’t have that level of expertise, especially with all the technical terms. But we think we know graphic design well enough to give you a better poster, and we know PowerPoint well enough to anticipate the problems it might give. 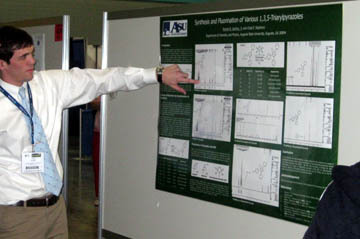 It’s all about you, standing in front of an attractive poster that speaks well of you and the research you have done. We care about doing that, and doing it well. We think it shows in our work!